When KTM CEO Stefan Pierer bought Husqvarna, the ex-Swedish bikemaker, he told BMW, then owners, he didn't want anything except the brand. Italian brand SWM, backed by Chinese money, picked up the Husqvarna factory and assets. And that's the Varese factory from which the SWM Superdual comes from, a motorcycle based on an older Husqvarna TE610. 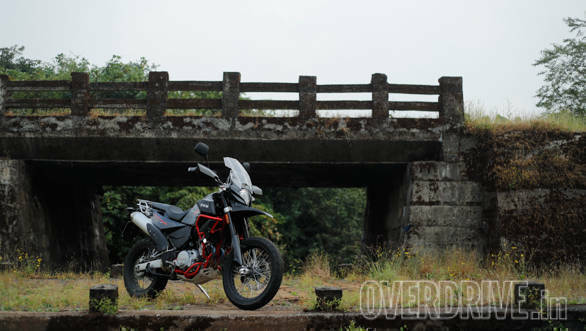 In India, SWM is represented by Motoroyale, which also retails other brands, including MV Agusta, FB Mondial, Hyosung and shortly, localised Nortons. The SWM SuperDual is the most dirt-bikey motorcycle money can buy. Bodywork is plastic, as is with most dirtbikes, there is genuinely long travel suspension, over 200mm at either end, a headlight that's smaller than the palm of your hand, a high front fender without a second mudguard and a combination of 19" and 17" spoked rims. As a dirtbike-based machine, it also has a seriously tall seat - 893mm, serrated footpegs (with rubber inserts) and a tall handlebar that works while sitting as well as when up on the pegs. 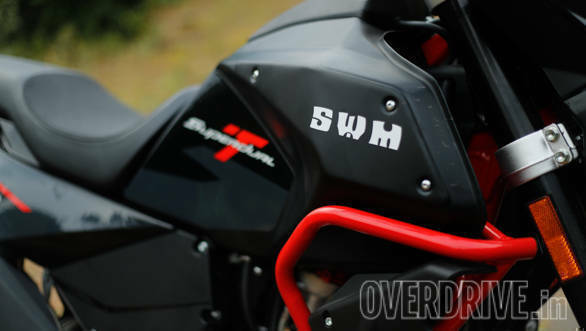 The SWM Superdual engine is a simple one. It's an updated to current day 600cc single, based on an old Husqvarna motor. It has liquid-cooling, fuel-injection and... that's it. The gearbox is a fast-shifting 6-speed unit and the only electronics it has is ABS, which you can turn off for the rear wheel via a conveniently located toggle on the right switch cluster. 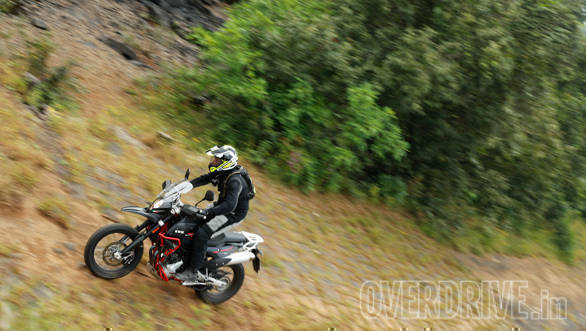 In terms of performance, the SWM SuperDual is very likeable. The engine makes a lot of torque and while peak power is not a lot - 54PS - the engine feels exactly as snappy as you expect on a dirtbike. 0-100kmph comes up in 6.31 seconds and top speed is over 180kmph. In the real world, the torque spread makes the SuperDual easy to ride fast or slow. If you do trundle at low revs, there is some surging but it cleans up as the revs ride. 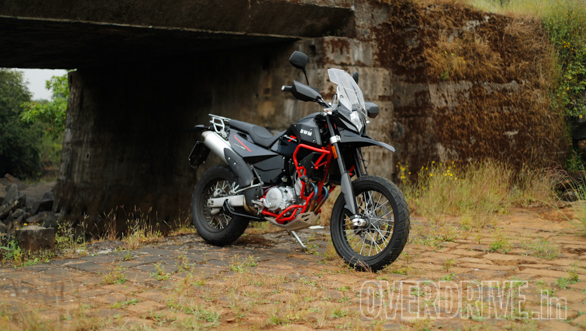 Unfortunately, between the nature of a big single and the tuning work SWM has done, the engine is not as refined as Indian customers typically expect. There is already some vibration in the footpeg by 4,000rpm - 100kmph in top gear. By the time you get to 120kmph, the tank is vibrating insistently as well. 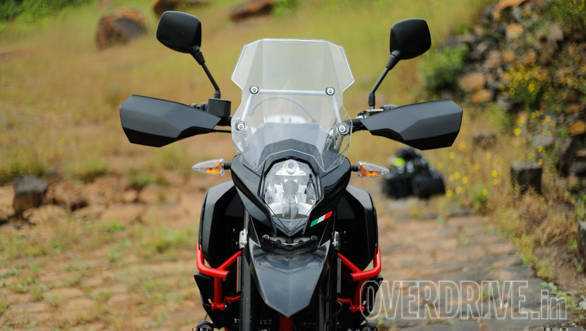 And by 130kmph, there is vibration in the handlebar as well. The engine also makes tappet sounds, though the Motoroyale guys said that's part of the nature of the engine, not a sign of trouble. Fuel economy is good, just over 23kmpl in city and just over 27kmpl out on the highway. Combined with a 17 litre tank (as per Motoroyale's spec sheet), that's a good range if you're out touring. Props to the gearbox for positive shifts without any missed gear changes over a hard hard hard 700km of testing. The brake hardware is odd in the sense that four different suppliers do the braided lines, discs and calipers. But it works well. The bite is strong, feedback is good and because of the height and long travel suspension, you need to learn that despite the availability of ABS, the best way to brake is to chase the weight transfer rather than grab the lever as hard as you can. The cornering manners will surprise you. The SuperDual turns like a dirt bike. It falls to lean angles very very fast and that's almost scary until you get used to it. 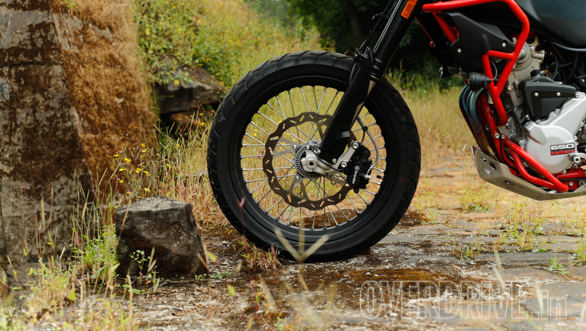 The Metzeler Tourance big-block pattern tyres are part of this behaviour with an extremely rounded profile that will become more natural as the thick centre tread wears down. But mid-corner stability is excellent and you can really use the torque to drive hard out of the corners. There's some adjusting needed to the riding position and how fast the SuperDual takes up lean angles but this is genuinely nice. Ride quality is odd. For the amount of suspension travel it has, the SuperDual feels quite stiff. Small bumps are annoyingly sharp too. But the strange thing is that if you can find the confidence to hit the same stretch going, say, 60kmph faster, then you discover a totally different motorcycle. One that feels like there isn't a road in India that it couldn't smother into feeling smooth. I wish SWM had made the suspension softer so that this amazing ride quality could be accessed at lower speeds as well. It would also make the tall saddle a little easier to live with. 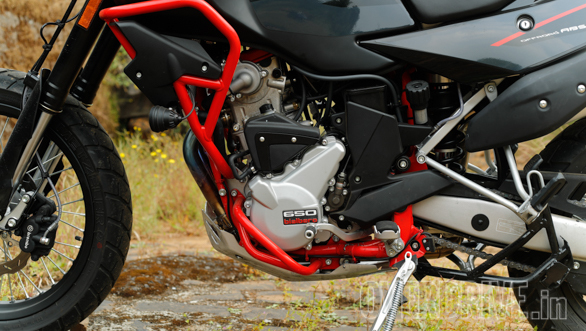 As in, you get rebound adjustment on the front forks - FastAce branded, and full adjustment on the rear Sachs monoshock and the base and T models both also get a remote preload adjuster as standard. The problem with going fast over the bumps is that the Brembo pads gets knocked off the pistons a little too often. And a firm brake lever will suddenly turn to mush leaving you pumping frantically to try and get the brakes back. After a while, you learn to finish braking before you hit the bumps but it must be said, that's very unsettling. 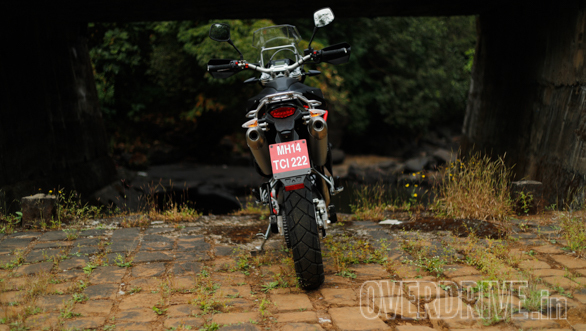 We have seen this issue on other bikes, like the KTM 390 Duke, but not this often. The SuperDual T isn't a very comfortable bike to ride long hours on. The seat is rock hard and the little scallop for the rider doesn't help all that much. However, in our experience hard saddles usually prove superior to softer ones once the foam beds in and your bottom gets used to it. So fingers crossed. The screen is non-adjustable but it sits to close to you that it's entirely buffet-free - wonderful. The Superdual does chuck muck back on itself, so the screen also gets filthy really fast, and some parts of it are hard to reach for cleaning. In terms of features, there aren't many. The little LCD readout is comprehensive but it's very hard to operate - the little button is impossible to find and use positively with gloved hands. And that headlight is next to useless and the little standard LED lights on the T model do not help much either. To be honest, I ventured into some really really bad roads with the SuperDual T just because it felt ready for it. And it proved me right. No matter how bad the going got, the SWM felt unshakeable and the suspension managed to sort the bumps out easily. In that sense, the 600cc single-cylinder, dirt-bike based machine is ridiculously India-correct. It's light, has tons of ground clearance, the suspension works out our roads easily and you can have a lot of fun pasting it almost anywhere you like. The tall riding position also makes commuting easier. However, the SWM SuperDual needs a fair bit of development work. Engine refinement is one issue that will make touring harder work than it has to - although all the other elements - pace, economy and range are there. The ride is too stiff at normal speeds. The quality and finish of the panels can stand improvement and the way the side panels are locked to the bike definitely can be improved. 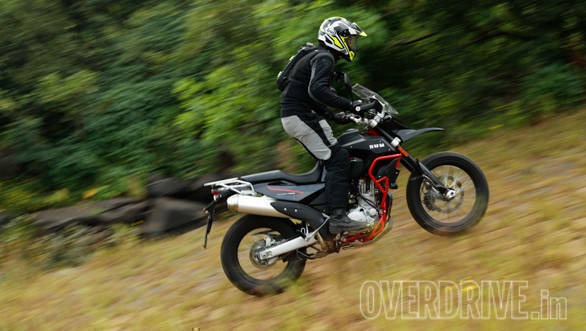 I am convinced by the SWM Superdual that if any manufacturer makes a reasonably priced, effective dirt-bike based middleweight in India, they'll have a hit on their hands. Because they'll go anywhere and tackle anything. 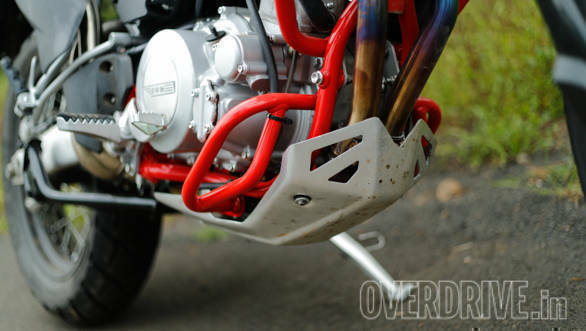 Unfortunately, the SWM SuperDual isn't that motorcycle just yet. It not only needs a little bit of work, there is also the matter of pricing. 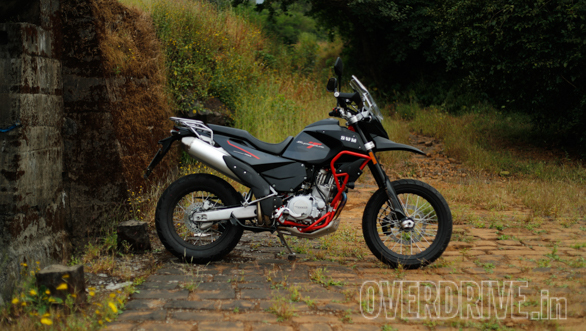 Motoroyale is SKD-ing the bike in India in the interest of price, but this is still a rather expensive motorcycle. The base model is just under Rs 7 lakh and this one, the T (add engine bars, LED lights, centre stand, rear rack and bits) almost hits a shocking Rs 7.2 lakh ex-showroom. 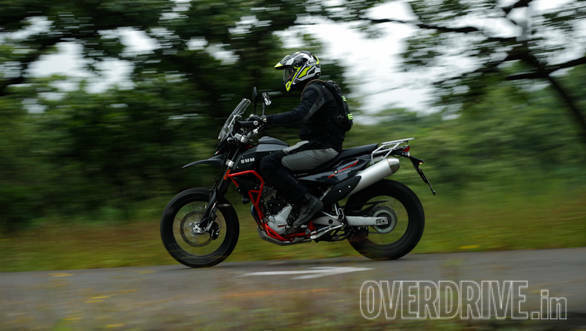 That doesn't compare favourably to the super-sweet Versys (Rs 6.69 ex-showroom) or the traction-control-equipped, gutsy V-Strom 650 (Rs 7.46 lakh ex-showroom). And remember, those are both twins so they're smoother as well as more powerful. 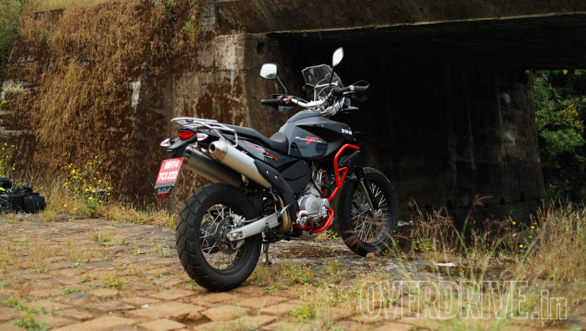 I suspect that the owners of the SWM Superduals will be a happy bunch if Motoroyale handles the aftersales experience well, and the motorcycle proves reliable. But I think that at these prices, this is will be a tough sell on the showroom floor. Which makes me sad, because potentially, there is a superb motorcycle in the SuperDual.